We’ve taken our time with Desnudo Tacos. We didn’t rush to go there when it opened back in early December, and have taken our good sweet time in taking the measure of the place. Maybe it was our inherent anti-taco temperament, cynical street food snobbishness and predisposition to dislike endless south of the border permutations that made us more circumspect. It was those, of course, combined with our (usual) quick draw readiness to dismiss yet another trite, hipster, downmarket “joint” that promises more than it delivers. So you might say we were lying in wait for it. Ready with sharpened keyboard(?) to vivisect everything from the recipes to the lighting fixtures. 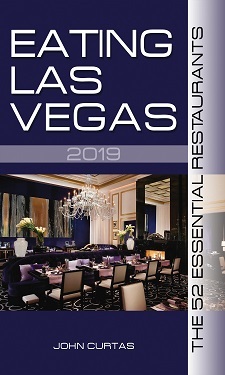 With cynicism running high, and overall enthusisam (for the entire Vegas food scene) at a fifteen year low, rushing to judgment wasn’t going to be in the cards for this newcomer. Reinforcing it all was an atrocious outing at Naked City Pizza this past summer. The terribleness of the pizza and sandwich we had at NCP was almost enough for us to self-impose a lifetime ban on any and all Chris Palmieri/Christian Dolias productions, but this one was supposedly inspired by Palmieri’s work with Rick Bayless, so we endeavored to cast all prejudices aside, but resolved to take our good, sweet time before taking the leap. Finally, last week we went in for lunch. Each time we stopped by, the place was empty, but for us and the owners. This is a shame, but the hole-in-the-wall location on the edge of Chinatown probably explains it. It probably also explains the cheap rent and an interior design that looks like a Hell’s Angel with good taste threw it together. All told we’ve had five different tacos, one burrito, the rice, the beans (more on them in a minute), and the best goddamn guacamole we’ve eaten in our humble burg. …lots of herb-y greenery — avocado and banana leaf, cilantro and guajillo chile — accent the goat, while creamy chipotle, tomatillos, roasted garlic, avocado and crema emphasize the pork’s sweetness without overwhelming it. Adding house-made chorizo to the mix is a stroke of artery-hardening genius. Achieving balance and harmony this complete in a corn tortilla is not something your average taco fan is used to. But Desnudo Tacos are to your average taco what great Mariachi music is to bad pop — filling your senses with layers of flavor, not one-dimensional pablum. As for the other three tacos we’ve tried, the carnita — pork shoulder braised in fresh lime juice, sprinkled with lime queso fresco (fresh Mexican cheese) — is the clear winner, but the pollo (chicken with pumpkin seed sauce) and carbon (marinated skirt steak) are no slouches either. Taking a page from the Rick Bayless cookbook, each pops with the taste of good ingredients, freshly prepared — not prepared from a can. Even such shopworn staples as beans and rice — commonly known around the ELV household as the side of the platter that gets scraped into the garbage — are given new life by actually cooking them on premises and not reducing each to a pile of tasteless mush and starch. Take a bite of either and two things will happen: your eyes will get wide and you won’t be able to stop taking forkfuls of them. All of this — the better groceries, thoughtful recipes and careful cooking — gives lie to the cheap, easy to fill up on reputation of most Mexican-American food. To the average American fast-food consumer — weaned on four buck, double-taco specials at a drive-through joint — the $6.50 price tag for one Desnudo order (for two) will seem high. But to those who want to take their tacos to a higher level, and see why this food got popular in the first place, it’s time to get naked. Rick Bayless would be proud. The last line from George may have 11.5 months to go to win the award, but is the early betting favorite for “Best Comment of 2014”. As interesting (and good) as the Desnudo tacos are, the tortas may be even better. But we should also put the price into perspective – $6.50 for two is the same as two loaded tacos at Los Tacos, and while Tacos El Gordo will get you three for that price, when sizes are compared it just about the same amount of food of the buck. For the quality, the Desnudo offerings can comfortably fit into the category of being a “bargain”. Having now dined at Desnudos Tacos, I have to say that I like it, but I still like Los Antojos better. The Desnudos tacos are, indeed, significantly larger, but in bang for the buck you can get four at Los Antojos for the price of two at Desnudos. Any place that will serve me goat tacos (whether they serve it as birria or chivo) gets my respect, though. I can’t get goat at Los Antojos, but I like their carnitas and tinga better, and their al pastor is simply outstanding, as good as I’ve had on this side of the border. Desnudos is a lot closer to where I live, though, so they may end up getting more of my business.